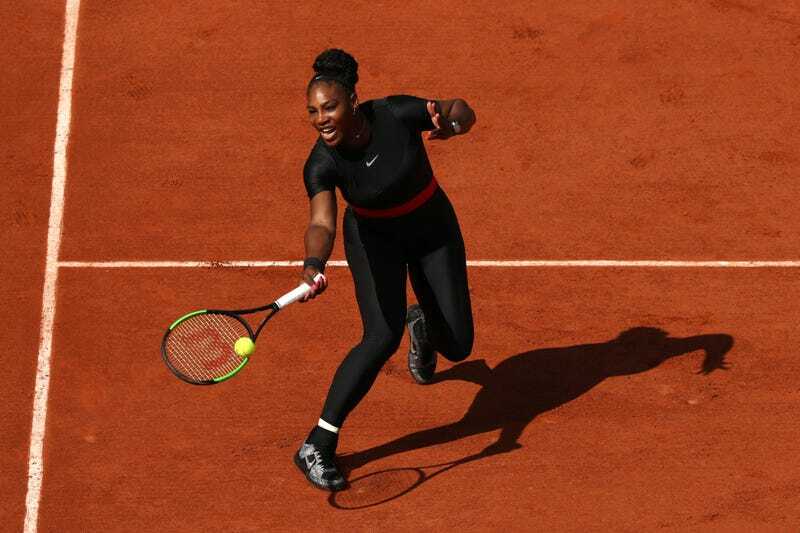 Serena Williams of the United States plays a forehand during her ladies singles first round match during day three of the 2018 French Open at Roland Garros on May 29, 2018, in Paris, France. As reported by Sports illustrated, French Tennis Federation (FFT) president Bernard Giudicelli told France’s Tennis magazine: “I think that sometimes we’ve gone too far,” explaining why a dress code is now being introduced to regulate players’ uniforms, and citing Williams’ form-fitting suit as an example. “It will no longer be accepted. One must respect the game and the place,” Giudicelli said of the outfit Williams said made her feel like a superhero, the compression of which notably gave her much-needed protection from the blood clots she’d been suffering since giving birth to her daughter last fall. Granted, one wouldn’t expect someone as style-savvy as Williams to wear the same thing twice, but it does sound like the FFT’s new standards may cramp the fashionista’s style. No word yet on the specifics of the new guidelines, or whether Williams’ U.S. Open wardrobe, co-designed with Nike and Virgil Abloh, would pass muster. All we know for now is that the French Open’s new dress code isn’t expected to be as restrictive as Wimbledon, where players are required to wear white. That said, Giudicelli said the FFT will be asking for an advance look at players’ uniforms for 2019.